The reforms of Constantine and Diocletian were characterized by establishment of a strict centralization of power, introduction of a vast bureaucracy, and definite separation of civil and military power. These reforms were not new and unexpected. The Roman Empire began its trend toward centralization of power as early as the time of Augustus. Parallel with Roman absorption of the new regions of the Hellenistic East, which developed through long centuries higher culture and older forms of government, especially in the provinces of Ptolemaic Egypt, there was a gradual borrowing from the living customs and Hellenistic ideals of these newly acquired lands. The distinguishing characteristic of the states built on the ruins of the empire of Alexander the Great of Macedon, Pergamon of the Attalids, Syria of the Seleucids, and Egypt of the Ptolemies, was the unlimited, deified power of the monarchs, manifested in particularly firm and definite forms in Egypt. To the Egyptian population Augustus, the conqueror of this territory, and his successors continued to be the same unlimited deified monarchs as the Ptolemies had been before them. This was quite the opposite of the Roman conception of the power of the first princeps, which was an attempt to effect a compromise between the republican institutions of Rome and the newly developing forms of governmental power. The political influences of the Hellenistic east, however, gradually changed the original extent of the power of the Roman principes, who very soon showed their preference for the East and its conceptions of imperial power. Suetonius said of the emperor of the first century, Caligula, that he was ready to accept the imperial crownthe diadem; according to the sources, the emperor of the first half of the third century, Elagabalus, already wore the diadem in private; and it is well known that the emperor of the second half of the third century, Aurelian, was the first one to wear the diadem publicly, while the inscriptions and coins call him God and Lord (Deus Aurelianus, Imperator Deus et Dominus Aurelianus Augustus). It was Aurelian who established the autocratic form of government in the Roman Empire. The process of development of the imperial power, primarily on the basis of Ptolemaic Egypt and later under the influence of Sassanid Persia, was almost completed by the fourth century. Diocletian and Constantine desired to effect the definite organization of the monarchy and for this purpose they simply replaced the Roman institutions with the customs and practices which predominated in the Hellenistic East and were already known in Rome, especially after the time of Aurelian. The times of trouble and military anarchy of the third century greatly disturbed and disintegrated the internal organization of the empire. For a while Aurelian re­established its unity and for this achievement contemporary documents and inscriptions bestow upon him the name of the restorer of the Empire ( Restitutor Orbis ). But after his death a period of unrest followed, It was then that Diocletian set himself the goal of directing the entire state organism along a normal and orderly path. As a matter of fact, however, he simply accomplished a great administrative reform. Nevertheless, both Diocletian and Constantine introduced administrative changes of such extreme importance to the internal organization of the Empire that they may be considered to be the true founders of a new type of monarchy created under the strong influence of the East. Diocletian, who spent much of his time in Nicomedia and was on the whole favorably inclined toward the East, adopted many characteristics of the eastern monarchies. He was a true autocrat, an emperor-god who wore the imperial diadem. Oriental luxury and the complex ceremonial were introduced at his court. His subjects, when granted an audience, had to fall on their knees before they dared to lift their eyes to view their sovereign. Everything concerning the Emperor was considered sacred his words, his court, his treasury; he himself was a sacred person. 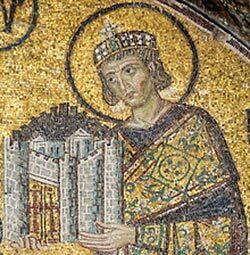 His court, which Constantine later transferred to Constantinople, absorbed large sums of money and became the center of numerous plots and intrigues which caused very serious complications in the later periods of Byzantine life. Thus autocracy in a form closely related to Oriental despotism was definitely established by Diocletian and became one of the distinguishing marks of government structure in the Byzantine Empire. In order to systematize the administration of the vast Empire, which included many races, Diocletian introduced the system of tetrarchy, of the power of four persons. The administrative power was divided between two Augusti, who had equal plenipotence. One of them was to live in the eastern, and the other in the western, part of the Empire; but both had to work in the interests of one Roman state. The Empire remained undivided; the appointment of two Augusti, however, indicated that the government recognized even in those days that a difference existed between the Greek East and the Latin West, and that the administration of both could not be entrusted to the same person. Each Augustus was to be assisted by a Caesar, who, in case of the death or retirement of the Augustus, became the Augustus and selected a new Caesar. This created a sort of artificial dynastic system which was supposed to do away with the conflicts and conspiracies originating in the ambitions of various competitors. This system was also meant to deprive the legions of their decisive influence at the time of the election of a new emperor. The first two Augusti were Diocletian and Maximian, and their Caesars were Galerius and Constantius Chlorus, the father of Constantine the Great. Diocletian retained his Asiatic provinces and Egypt, with headquarters at Nicomedia; Maximian kept Italy, Africa, and Spain, with headquarters at Mediolanum (Milan); Galerius kept the Balkan peninsula and the adjoining Danubian provinces, with a center at Sirmium on the River Save (near present Mitrovitz ); and Constantius Chlorus kept Gaul and Britain, with centers at Augusta Trevirorum (Trier, Treves) and Eburacum (York). All four rulers were considered as rulers of a single empire, and all government decrees were issued in the name of all four. Although theoretically the two Augusti were equal in their power, Diocletian, as an emperor, had a decided advantage. The Caesars were subjects of the Augusti. After a certain period of time the Augusti had to lay down their titles and transfer them to the Caesars. In fact Diocletian and Maximian did lay down their titles in 305 and retired to private life. Galerius and Constantius Chlorus became the Augusti. But the troubles which followed put an end to the artificial system of tetrarchy, which had already ceased to exist at the beginning of the fourth century. Great changes in the provincial government were introduced by Diocletian. During his reign the distinction between senatorial and imperial provinces disappeared; all provinces were dependent directly upon the emperor. Formerly, the provinces being comparatively few and territorially very large, their governors had enormous power in their hands. This condition had created many dangerous situations for the central government; revolts were frequent and the governors of these large provinces, supported by their legions, were often serious pretenders to the imperial throne. Diocletian, wishing to do away with the political menace of the large provinces, decided to divide them into smaller units. The fifty-seven provinces in existence at the time of his ascension were divided into ninety-six new ones, perhaps more. Moreover, these provinces were placed under governors whose powers were purely civil. The exact number of smaller provinces created by Diocletian is not known because of the unsatisfactory information given by the sources. The main source on the provincial structure of the Empire at this time is the so-called Notitia dignitatum, an official list of court, civil, and military offices, which contains also a list of provinces. According to scholarly investigations, this undated document refers to the first half of the fifth century and hence includes the changes in provincial government introduced by the successors of Diocletian. The Notitia dignitatum numbers 120 provinces. Other lists, also of doubtful but earlier dates, give a smaller number of provinces. Under Diocletian also a certain number of small new neighboring provinces were grouped together in a unit called a diocese under the control of an official whose powers were likewise purely civil. There were thirteen dioceses. In their extent the dioceses resembled the old provinces. Finally, in the course of the fourth century the dioceses in turn were grouped into four (at times three) vast units (prefectures) under praetorian prefects, the most important officials of that time. Since Constantine had shorn them of their military functions, they stood at the head of the whole civil administration and controlled both the diocesan and the provincial governors. Toward the end of the fourth century the Empire, for purposes of civil government, was divided into four great sections (prefectures): (l) Gaul, including Britain, Gaul, Spain, and the northwestern corner of Africa; (2) Italy, including Africa, Italy, the provinces between the Alps and the Danube, and the northwestern portion of the Balkan peninsula; (3) Illyricum, the smallest of the prefectures, which embraced the provinces of Dacia, Macedonia, and Greece; and (4) the East, comprising the Asiatic territory, as well as Thrace in Europe in the north and Egypt in the south. Many details of Diocletian's reforms are not yet available because of the lack of adequate sources on the subject. It should be stressed, however, that in order to secure his power still more against possible provincial complications, Diocletian strictly separated military authority from civil authority; from his time onward the provincial governors had only judicial and administrative functions. The provincial reforms of Diocletian affected Italy in particular; from the leading district she was transformed into a mere province. The administrative reforms resulted in the creation of a large number of new officials and a complex bureaucratic system with strict subjection of the lower officials to the higher. Constantine the Great further developed and enlarged in some respects the reorganization of the Empire begun by Diocletian. Thus the chief features of Diocletian's and Constantine's reforms were the definite establishment of absolute monarchical power and a strict separation of military and civil functions, which led to the creation of a large and complex bureaucracy. During the Byzantine period the first feature was preserved; the second experienced a great change because of a constant tendency to concentrate military and civil authority in the same hands. The numerous offices and titles were retained in the Byzantine Empire. This bureaucratic system survived to the last years of the Empire, but many changes took place in the nature of the functions and the names of the dignitaries. Most of the titles were changed from Latin to Greek; many offices degenerated into mere titles or ranks; and a number of new offices and dignities were created during subsequent periods. A very important factor in the history of the Empire in the fourth century was the gradual immigration of the barbarians, that is, the Germans (Goths). A detailed examination of this question appears after the discussion of general conditions in the fourth century. Constantine the Great died in 337 A.D. He has met with rare and deep appreciation from many different points of view. The Roman senate, according to the historian of the fourth century, Eutropius, enrolled Constantine among the gods; history has named him the Great; and the church has proclaimed him a saint and equal of the Apostles ( Isoapostolic ). Modern historians have likened him to Peter of Russia and Napoleon. One God was proclaimed to all mankind. At the same time one universal power, the Roman Empire, arose and flourished. At the selfsame period, by the express appointment of the same God, two roots of blessing, the Roman Empire and the doctrine of Christian piety, sprang up together for the benefit or men... Two mighty powers starting from the same point, the Roman Empire swayed by a single sovereign and the Christian religion, subdued and reconciled all these contending elements.